In Alaska, it was so easy to stay creative and inspired to photograph the beauty. There was an all you can eat visual buffet in front of you 24/7. Walks, drives and adventures were plentiful, and my camera was always by my side. Toronto, however, is a different story. That all you can eat buffet? More like a continental breakfast with a few stale croissants. Not so visually pleasing. I'm in a photography rut and I need to get out. Each photographer is unique and that means different things inspire and motivate them. But, every photographer hits a wall at one point or another. 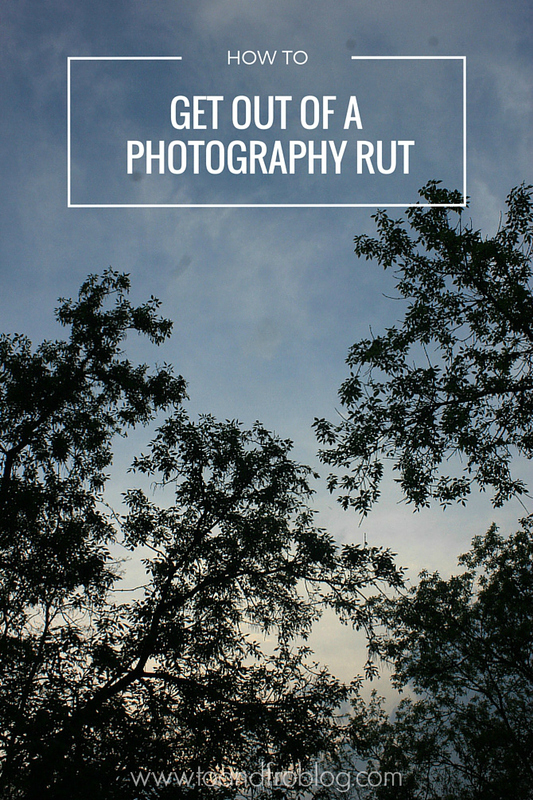 Do you enjoy taking photos but ever find yourself in a rut? Get out of your comfort zone. You’ve been photographing nature for years? Try portraits! Write a list of things you’ve never photographed before and make it a point to learn the techniques to achieve those shots. Practicing a different style of photography will teach you to look at things from a different perspective. Check out these tips for iPhone photography. 2. Create an assignment for yourself. For example, try taking a photo every single day for a year, go on a photo walk every week for one year, challenge yourself to photograph 100 strangers or take a picture of an object that starts with every letter of the alphabet. Although they may be pricey, just being around other photographers can be inspiring. This will also help your broaden your skill set. 4. Arrange a photographer meet up in your area. Get together with people that share the same passion. Meet regularly and choose a new theme each meeting. You will learn something new from fellow photographers and getting together will help keep the passion for photography alive. 5. Try a change of scenery. Take a trip or go for a drive. Going on a new adventure will offer a fresh perspective on things. 6. Learn to use an editing software. Editing software will help transform your pictures. Can't afford fancy software for your computer? No problem! There are some great apps available on smart phones these days. These completely FREE apps are my favourite. 7. Rent a new piece of equipment. Experiment with something new, like a new lens, camera or accessory. Buying new equipment is a big investment, while renting for a weekend is quite affordable and also the best way to test it out before you commit to purchasing. Check out some of the go-to items in my camera bag. Writing a list of things you've never photographed or a "dream shot" list. Then, get out there and start crossing things off the list! Volunteer to photograph an event or donate some of your work to fundraisers you support. While working at the Zoo, a colleague and I enjoyed photographing the animals we worked with. We would then donated some of photos to the Zoo's fundraising events. Go through magazines or look online for inspiration. Remember the goal is not to copy their work but to draw inspiration from it. 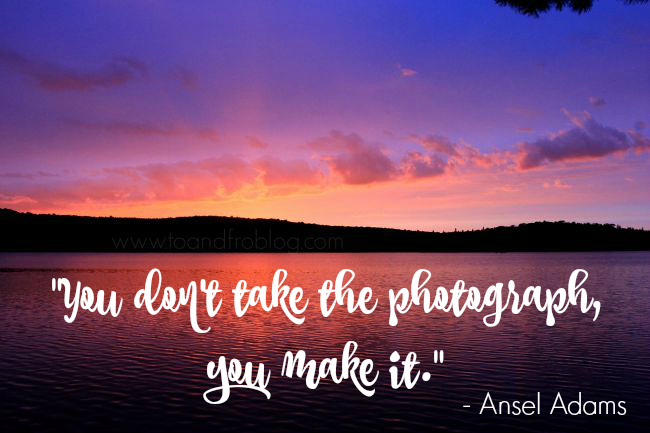 At the end of the day, the most important thing to remember when taking photos is to enjoy it. If you don't enjoy what you're doing, then why are you doing it? I think I am pretty much a click and go kinda person in my everyday life. Often I will think, Oh I wish I had a camera right now! My favourite things to photograph are probably buildings! Maybe that's why NYC is one of my favourite places - there is never a bad photo there. I'm in a rut right now and it's terrible. You know what I've been thinking about trying though? The photo an hour challenge! This is really great! I found a lot of those tips can be used for anything creative, like writing or drawing! These are all excellent ideas!! I've pinned it for future reference. Before we moved I would get stuck in a rut often, constantly wondering what the heck to photograph! I like the idea of a photography meet-up especially!